Chloë Grace Moretz's revelatory performance as an 11th-grader sent to a forested encampment for some serious "de-gaying" is undoubtedly the highlight of this film. Rating: 4 stars out of 4. In “The Miseducation of Cameron Post,” young Cameron (Chloë Grace Moretz) gets caught making out with a girl at her 11th-grade homecoming dance and is promptly exiled to a forested encampment for some serious “de-gaying.” God’s Promise rehabilitation camp doesn’t broker in extremist techniques like chemical castration or electroshock treatment. Instead, its patients get a healthy dose of God and guilt. “What feels like fun is actually the enemy,” Cameron is advised by the camp’s director and spiritual guru, Dr. Lydia March (Jennifer Ehle). The film’s greatest strength is that everyone, even Dr. March, is portrayed evenhandedly. Her philosophy may be delusional and harmful, but she’s far from the mustache-twirling Disney villain you might expect. Dr. March is a pointed reminder that emotional abuse often comes in the guise of a helping hand rather than a punishing fist. Director Desiree Akhavan wisely avoids many of the predictable pitfalls of “coming of age” stories. There are no emotional epiphanies punctuated by a musical crescendo or characters making speeches that are wise beyond their years. And there’s certainly no big finale at the prom. Working from Emily M. Danforth’s novel of the same name, Akhavan realizes that these are just confused kids sequestered in the wilderness and her best course of action is to stay focused on Cameron’s personal journey of sexual discovery. Cameron is not your typical rebellious teenager. Yes, when she arrives at God’s Promise, she’s confused and angry, but she’s more interested in decoding her jumbled feelings than tormenting the camp’s counselors. The more raucous moments of anarchy, such as Cameron and her campmates having a singalong to 4 Non Blondes’ “What’s Up,” are emotionally eclipsed by the quiet exchanges in darkened dormitory bedrooms. When a self-loathing counselor, himself a product of Dr. March’s treatment, confides his pain to Cameron’s therapy group, the anguish is palpable. This isn’t a lighthearted affair about wacky kids fighting the system; this film understands that sexual identity is an essential part of our existence and treats it with the proper reverence. Chloë Grace Moretz’s revelatory performance is undoubtedly the highlight of “The Miseducation of Cameron Post.” Though Cameron is more comfortable nurturing a silence than speaking her mind, Moretz’ wry smile and weary eyes convey volumes of emotional turmoil. She is the soulful, courageous heart of a film that exalts the strength of human dignity. For all those labeled by society as deviant, there is hope in knowing you are not alone. 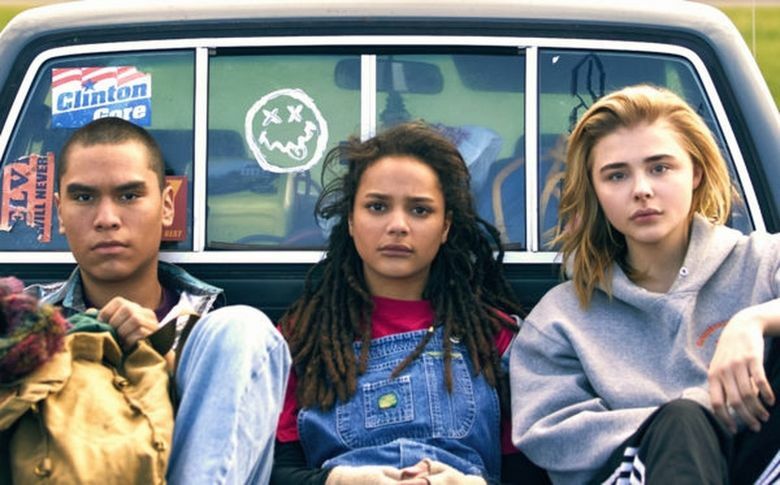 ★★★★ “The Miseducation of Cameron Post,” with Chloë Grace Moretz, Sasha Lane, Forrest Goodluck, Jennifer Ehle. Directed by Desiree Akhavan, from a screenplay by Akhavan and Cecilia Frugiuele, based on a novel by Emily M. Danforth. 91 minutes. Not rated; for mature audiences. SIFF Cinema Uptown. J.R. Kinnard: on Twitter: @jrkinnard.